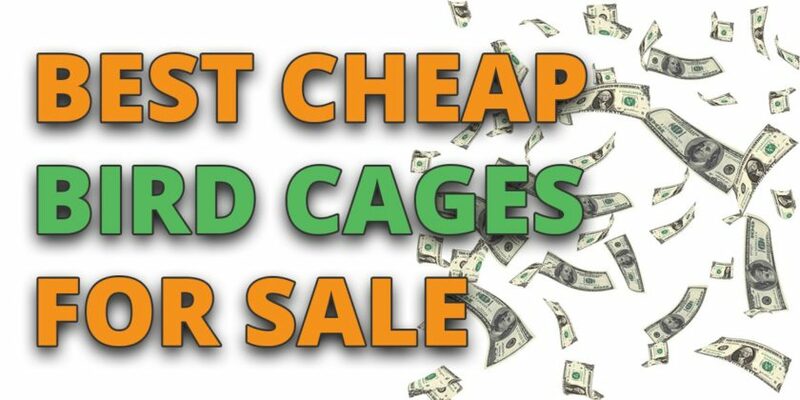 Money can be a limiting factor when buying a bird cage, but if you’re smart, then there are plenty of bargains available. Simply figure out your spending limit and then use the reviews in this article to find the correct cage to match your budget. 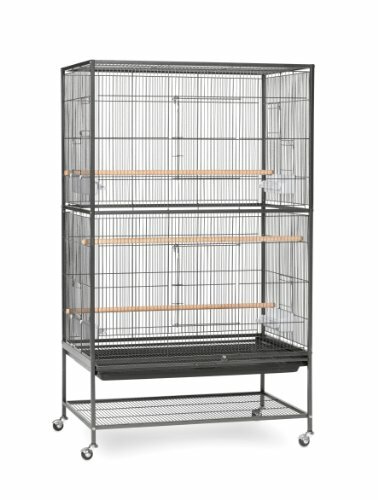 What to look for with inexpensive bird cages? The building materials of a bird cage is one of the first things that is sacrificed if you’re on a budget. However, the building materials used are also of the utmost importance. This is because birds chew on their cages and so using incorrect materials can potentially be toxic and unsafe for your birds health. So when choosing a cheap bird cage, ideally you want it to be made from bird safe materials such as wrought iron, stainless steel, aluminium or acrylic. Avoid unsafe metals such as brass, copper, lead, tin and zinc. When it comes to ‘galvanized steel’ the general rule is that galvanized steel before welding is unsafe whereas galvanized steel after welding is safe. Additionally, powder coated paint is usually applied to bird cages and this process makes the paint stick to the bars of the cage more effectively. With this, it is unlikely for your pet bird to be able to consume any of the paint on the cage bars. If these are not included in the bird cage then you’ll need to consider buying extra items as part of your budget. Extra accessories you may also want to consider include: toys, cage covers, nest boxes, lighting, fans and heaters. 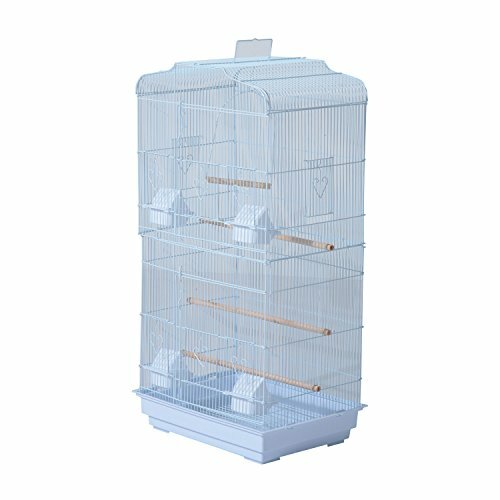 A well designed cage will make looking after your pet birds far easier and so there are a few small things you should check for. A removable floor or tray will makes the cleaning of the cage much simpler and quicker. With this feature, you can leave your birds in the cage whilst you swap out the bird liner for a new one. If the base of the bird cage is slightly raised to the sides then it is more likely to capture any bird waste and prevent parrot droppings from hitting the ground. If the bird cage door has a latch on it or somewhere you can apply a padlock then this will make the cage more secure against children. Also, small side doors for changing the bird food and water stations will make providing daily meals easier. Also, think about the shape of the cage. Corner shaped cages will also save you room in your room. 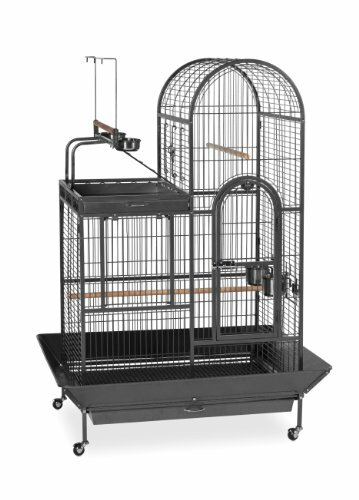 Whereas something like a playtop cage will provide your birds with extra entertainment. Of course cage size is going to affect the price of a bird cage. However, this is not an area you want to skimp on and it’s always best to provide your bird with the most amount of room neccessary. But consider the species of bird you’re looking after. For example, parakeet cages and finch cages won’t need as much space as larger sized parrot cages. Inside: Two feeding cups, two perches, one swing and pull out tray. Comes with a number of furnishings. Has a handle for easy carrying as a travel cage. Not to be used as a permanent cage. This is still worth a buy so it can be used as a backup or travel carrier. Fast delivery and easy to put together. Spacious if you only have few small birds. Comes in a variety of sizes and colors for you to choose from. The quality of the materials are a bit flimsy. Too small for larger sized birds. A good option if you’re looking to house a few small birds. Large and spacious allowing extra room for flight. The bottom has a storage area for extra items. Access doors for different parts of the cage. Incredibly well priced considering it’s size. Setting up might require more than one person. 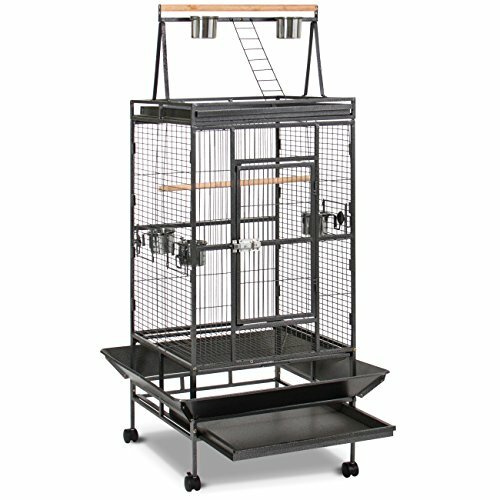 After buying this cage, you’ll understand why a cage of such size and features is a bestseller. Lot’s of room for your birds to flap without them damaging their wings. Easy to clean and maintain thanks to access doors and removable tray. Great value for money considering the size of the cage. Comes with a playtop and ladder to keep your birds busy. Some customer’s have reported shipping and packaging issues. 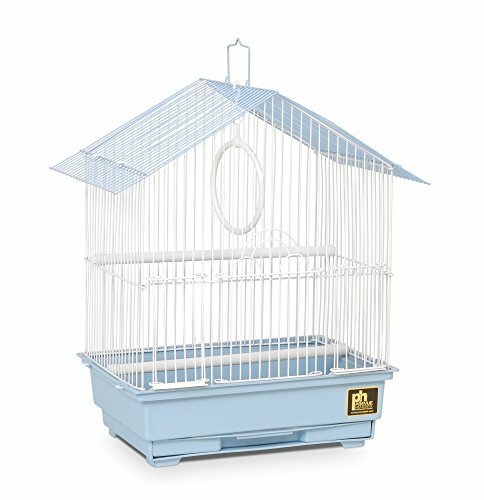 Aimed at medium sized birds, this is the best cages for birds of this size and includes all of the features that medium sized birds could possibly need. High quality craftsmanship goes into building the cage. Available in lot’s of different colors. Bottom side guards catch any spill out mess. From a reputable brand that is known for it’s high end cages. Takes some patience to put together. If you’re looking for a good cage for larger sized birds then this is the one to get. Unique double roof design that’s attractive to look at and provides extra functionality. Contains both a dome top and a play top. Extra spacious for your birds. Full swing out door provides easy access. Some customers have said that the welds and paints aren’t to the highest standard. As with a lot of larger cages – issues have been reported with the packaging and delivery. A large and uniquely designed setup, this bird cage comes fully furnished on the inside. 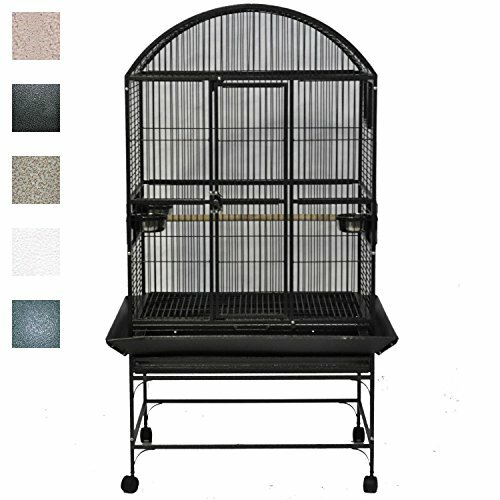 A great deal for a premium bird cage of this size and features. However, a few small drawbacks means the cage loses a star. Considering the price and size you get a lot. Very tall so it allows smaller birds to flap their wings. A good buy as a backup or part time cage. The feeding/watering trays are not very adequate or accessible. The quality of the materials are a bit low. Expect to make a few minor adjustments. One of the best wrought iron cages that still is of a decent size in this range. Good for use as a secondary/temporary cage. Removable tray makes cleaning easier. Even comes with porcelain cups. Stylish decorations on the base. Larger sized birds will be constrained. Beautiful decorations and using the highest quality stainless steel materials. Small in size but one of the best hanging or stainless steel bird cages available. Wall mountable or for use with a stand. Hybrid design includes both bars and acrylic. May need adjustments so that the cage fits together properly. Acrylic may not be to the highest standard. The modular design allow multiples of this cage to be stacked on top of one another. This acrylic cage provides an extra clear view for you and your birds. Occasionally, pet companies provide special deals and offers when trying to make a sale on their products. These tend to occurs particularly around holiday seasons and you’ll also be able to get clearance items when companies are trying to get rid of old stock. To find the best clearance bird cages and discounted items currently available, keep an eye out in your emails for deals. Instead of buying a bird cage at once, some companies also provide the option to pay for it using installments. This is a little-known about option for people that desire a high end bird cage. Other options include paying for half of the cage upfront and then having the option to pay for the rest of the cage over the next 12 months.